This winter I've noticed these dark sepia-colored "stink bugs" (or "shield bugs", as some call them) in my house. Following the Buddhist golden rule of "Do No Harm", I gently escorted these critters out the door and let them go about their buggy way. As it turns out, my mercy for creepy-crawlies may have been a bit premature. For you see, these were no ordinary stinkbugs. 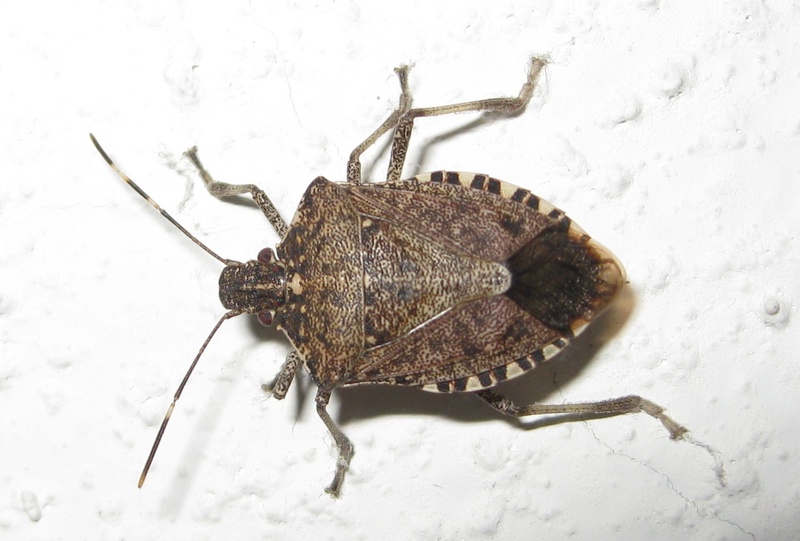 They were the dreaded Brown Marmorated Stink Bug, which is indigenous to China and did not exist in North America until 1998, when an infestation of them manifested out of nowhere in Pennsylvania. Apparently they stowed away in some shipment of items from China, and immediately gained a foothold in the new world. Since then, the stinky plague has spread to 33 states, including Kentucky, which had its first sightings a few months ago. Eight more states have been added to the list since last autumn. So what's the big deal, since stinkbugs don't sting, don't bite, and don't swarm around your head driving your crazy? Well, they eat like a bug possessed. And they love to gnaw on crops such as tomatoes, apples, pears, soybeans, peppers, corn, grapes, berries, peaches, green beans, cherries, raspberries, and many more. Some farmers have lost their entire crop to stink bugs, and there is no natural predator in North America for them. When next I see a stinkbug, will I let it live? Probably. I'm soft hearted/headed that way, and also know that statistically one more won't make a difference in the bug - er, big - picture. You forgot to thank China for its defective drywall. I have apple trees in my yard. I discovered many of these nasty bugs around my house over winter as well. I am an agriculturalist....but still....in my house??? Ewwww! I too, do my best to just put most insects outside....but these little babies were on my kill list this year. Invasive little suckers! I didn't know what they were at the time, but these bugs were all over my beefsteak tomatoes last summer, first time I'd noticed that. They ate into the tomatoes which then rotted where eaten.